One of the things most fans were impressed with as soon as Star Wars: The Force Awakens started production last year was director J.J. Abrams' commitment to practical effects. Instead of green-screen backdrops and CGI creations, the filmmaker opted to honor the original trilogy, employing practical creature effects and shooting on massive sets, as opposed to the digitally-created world of the much-maligned prequel trilogy. It seems this tradition is continuing with the first spinoff, director Gareth Edwards' Rogue One: A Star Wars Story, which started production in London back in August. While promoting his new web series Con Man, Rogue One star Alan Tudyk praised the production for creating a "physical world." "You are amazed at what you can look at, because it is a physical world. If there are creatures, then there are creatures; if there are spaceships, then there are spaceships. It's not huge swaths of green hung from the rafters. You have it all there, and if you don't have it there then you go fly some place that does." All we know about Rogue One: A Star Wars Story so far is that it will follow a group of Rebels embarking on a mission to steal plans for the original Death Star. The identity of Alan Tudyk's character has not yet been revealed, but the official cast announcement from August revealed that he is playing a "performance-capture character." Regardless of who he plays, the actor is surrounded by a stellar and diverse cast that includes Felicity Jones, Mads Mikkelsen, Ben Mendelsohn, Diego Luna, Forest Whitaker, Donnie Yen, Riz Ahmed, Jonathan Aris and Wen Jiang. Gareth Edwards is directing from a script by Chris Weitz, who rewrote the original draft by Gary Whitta, which was based on a story idea crafted by veteran ILM visual effects supervisor John Knoll. Disney and LucasFilm have set a December 16, 2016 release date for this spinoff, which is set between the events of Star Wars: Episode III - Revenge of the Sith and Star Wars: Episode IV - A New Hope. There has been speculation that characters from the animated TV series Star Wars Rebels may show up in this movie, since both projects are set within the same timeline. Since principal photography is still under way on Rogue One: A Star Wars Story, it isn't known when the first trailer may arrive. Alan Tudyk's praise of the physical sets shouldn't be too surprising, since the first cast photo released in August showcased several of the characters on a massive set, with no green-screen in sight. 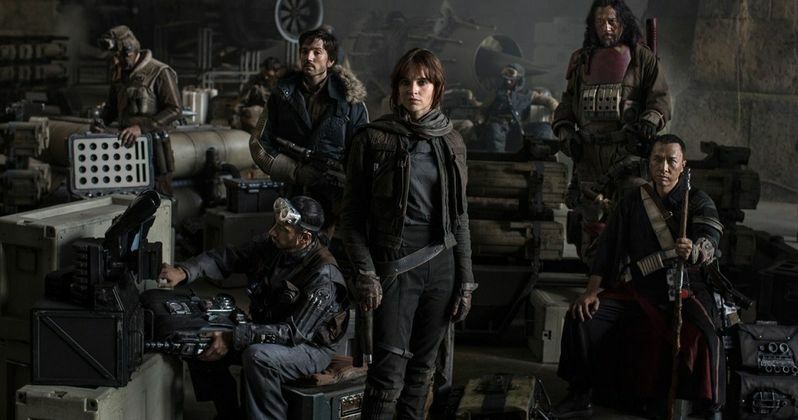 What do you think about these new Rogue One: A Star Wars Story details? Stay tuned for more on this highly-anticipated spinoff as we get closer and closer to its December 16, 2016 release date.